The first ad in the Glasgow Times was placed by Wm. McGuiness in 1955. The rumor is that the penurious leadership in the band bought the cheapest possible spot for less than $.05. It was a success however, as they started to see immediate responses. The first two to come over were James Kerr from Kingshill Colliery Pipe Band and Alex Colville from Shotts & Dykehead Pipe Band. James became Pipe Major and Alex, the leading drummer. Many other notable players of the time emigrated including Dave Armit, himself a player with Shotts and solo World Champion, Matt Hamilton (champion tenor with Shotts), Tam McGuirk (world champion bass drummer from Fife), Bill Greenlees (Bowhill), Alec Dougherty (Muirhead & Sons) George McKendrick (Glasgow Police), Bob Burnett (Clan MacRae Society), Neil Gow (Bucksburn & District), Bill Cowan (Renfrew & District), Roddie McDonald, George McIntyre (Campbelltown), Lewis Martin (MacKenzie Caledonian), Peter Buchanan (MacKenzie Caledonian) Hamilton Workman (Lord Mountbatten’s personal piper) Willie Bauld (Balingerie), Terry McGinty (Kingshill Collier PB) and many, many others. 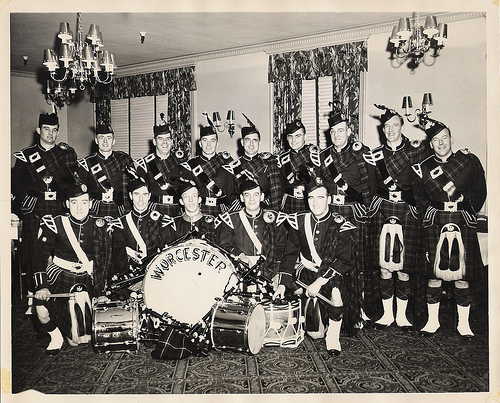 The practice of bringing top players over continued until the mid-1960’s and it is estimated that in the 11-12 years of this program, the band brought over between 30 and 40 players to the Worcester area. Some went back, but most stayed in the US and several players of the band learned from this esteemed group including Lead Drummer, Colum Lundt who credit’s Armit and Colville with much of his success. In addition to Denholm and Kerr, the band has had many Pipe Majors who led the band over the years. These include Dave Stark, John Reid, Bill McGinnes, Jimmy Rankin, Greg Morrow, Bob Burnett, George McKendrick, Donald Ritchie, Iain Massie, John Sullivan, Ryan Fabrycki, Greg Markiewicz and Neil Gow. Neil Gow passed away in 2016, but it was Neil who kept the band going for many years by dedicating his time to teach young players. Three of his students continue to play with the band and the band is extremely grateful for his commitment and dedication. With this tradition and strong connection to Scotland (and Shotts), it is fitting that the band elected to Pipe Major, Davy Methven in 2012, who also came over from Scotland and the Shotts & Dykehead Pipe Band. A former World Champion, Davy spent 10 years with Shotts as a prominent front rank player. He was also the Pipe Major of the Royal Burgh of Stirling Pipe Band when they won the Worlds in Grade 3 in 1992 and of the Clan Gregor Society Pipe Band when they won the Worlds in Grade 2 in 2003.